Kipling was a British journalist and author who is best known for his tales of adventure. He was the first Englishman awarded the Nobel Prize for literature. Kipling was the first child of John Lockwood Kipling and Alice Macdonald Kipling. His father was an architectural sculptor at the Bombay School of Arts and spent his early childhood in the British colony of India. Both his parents were children of Methodist ministers and their spiritual convictions color many of Kipling's works. 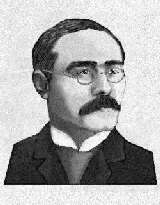 Kipling traveled to England for his education at the United Services College at Westward, North Devon where he vigorously pursued and obtained a position writing for and editing the school newspaper. He returned to India when he was seventeen and because of his college experience he landed his first job with the Lahore Civil and Military Gazette. Assigned to cover a variety of stories, all across India, for this paper and the Allahabad Pioneer, he slowly gathered material that would fill his books, which were beginning to appear. His early verse and short stories were published in newspapers or for the Indian Railway Library. They were later collected under various titles. His first publication, Departmental Ditties in 1886, was consumed chiefly in England by an audience eager for impressions of the savage Indian subcontinent as viewed from a distance. With the release of Plain Tales From the Hills in 1888 he seemed destined for greatness. The Light that Failed, published in 1890, was also successful, and Kim, published in 1901, is generally considered his masterpiece. Kipling's India has often been called England's India. Through his writings he expressed optimistic notions of colonialism. He believed the responsibility of England was to oversee under- developed countries. He justified for many what has been called the "white man's burden," and showed how it could be efficiently implemented with dignity. He was a prolific and consistent writer pouring out works for young audiences such as The Jungle Books in 1894 and 1895, Captains Courageous in 1897, and The Just-So Stories in 1902. Rather than categorizing his work it is more useful to regard Kipling's talent as lying in his ability to master a number of genres. After leaving India Kipling circumnavigated the globe, touching every continent. While in the United States he married Miss Caroline Starr Balestier of Vermont in 1892. He lived with his bride in the United States until 1896. After a falling-out with the in-laws the Kiplings went to England to live, settling finally at "Bateman's" in Sussex in 1902. His middle life provided financial and personal rewards as he continued a hectic life of travel and adventure reflected in his writings. He was a newspaper correspondent on naval cruises, made a second visit to America, and went to South Africa to report on the Boer War. He was an active and distinguished commentator on the action and events in World War I. He received many honors such as the doctor of law degree from McGill University in 1899, the doctorate of letters from Oxford in 1907, and from Cambridge a year later. Further, in 1907 he became the first Englishman to win the Nobel Prize for literature. It confirmed his greatness was recognized beyond the confines of the English- speaking world. When he died he was buried in the Poets' Corner of Westminster Abbey.